BLACK... Absence of light and enveloped in darkness. The color black is power, fear, strength, elegance and emotion. It has a richness all it's own that is deep, mysterious, edgy and glamorous. Black is stylish, thought provoking, sophisticated, formal and prestigious. Black is associated with the unknown or negative, but also represents power and strength. 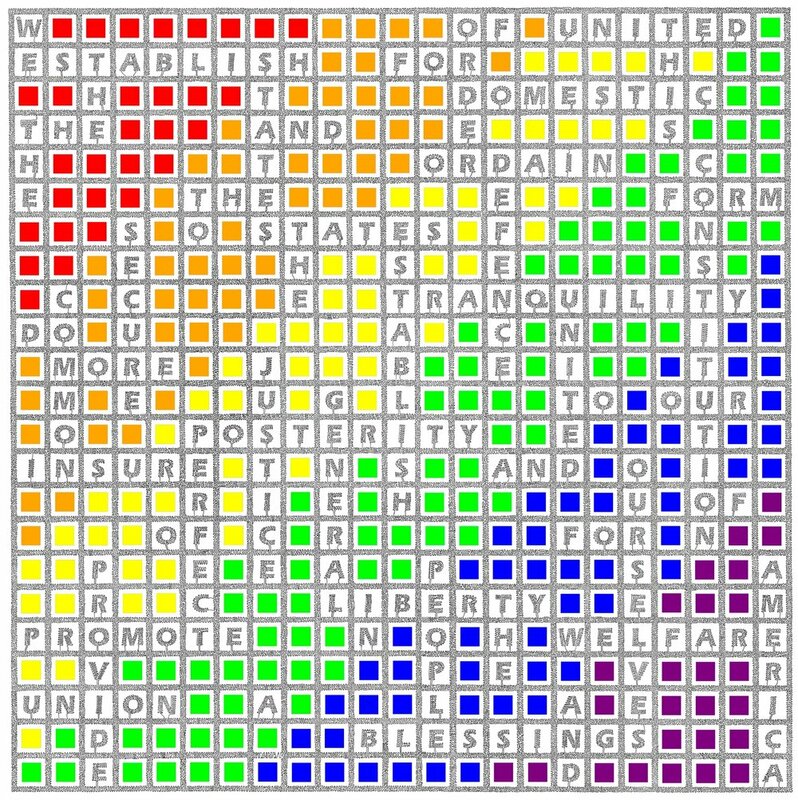 Here it is used as the predominant color. This is a collection of work created by integrating the textures, shapes and colors of recycled materials to form art that is imaginative, tactile and uniquely original. Terrilynn Moore was born in Denver, Colorado in 1956. She was a Denver Police Officer for ten years and also worked in a mental health facility. Currently, Terrilynn is working on her ‘Nappy Edges—a multi-media, abstract exploration of being black in white American culture. The frustration, pain and chaos of living and working in a society that often degrades, humiliates, incarcerates and undervalues people of color. The irony of her police background serves as fodder for her art. Terrilynn received her BFA in Painting and Drawing from the University of Colorado Denver in May of 2017. In June of 2014 she was awarded the College of Art and Media Visual Arts Travel Scholarship. Terrilynn currently lives in Aurora, Colorado. Lines, cloth, Thread, Knots… a destiny in the weaving! We are weavers of our lives, each experience can be an important thread used by our consciousness to connect with one another and create our own essence. That’s why our intuition is guided by the thread of our soul. I like to thing that the works of this series symbolize elements of my life tapestry. Through exploring more traditional working methods while focusing on contemporary subjects in unexpected or unfamiliar situations - Chuvarsky’s paintings seek to document current events, the artists daily life, the absurdity of modern politics, and childhood nostalgia. All while examining the placement of the subject within the picture plane and the feeling it invokes. Donny Dixon manipulates fire to explore powerful imagery of daydreams and nightmares. 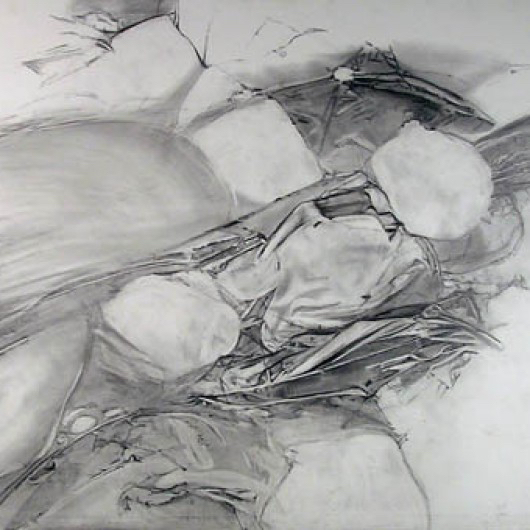 Drawing upon ideas and pictures that flicker just outside of consciousness, Dixon uses elements of fire such as smoke and ash to permanently sear these images onto his canvases. "Paper Dreams" is a collection of dream-inspired illustrations made over 5 years. The stories of my dreams are vividly fantastical, and I use paper to illustrate the icons, figures, and scenes of my subconscious. Paper cutting and color choices are deliberate, and the transformation in form and meaning, from memory to paper shapes, is what inspires me to create. 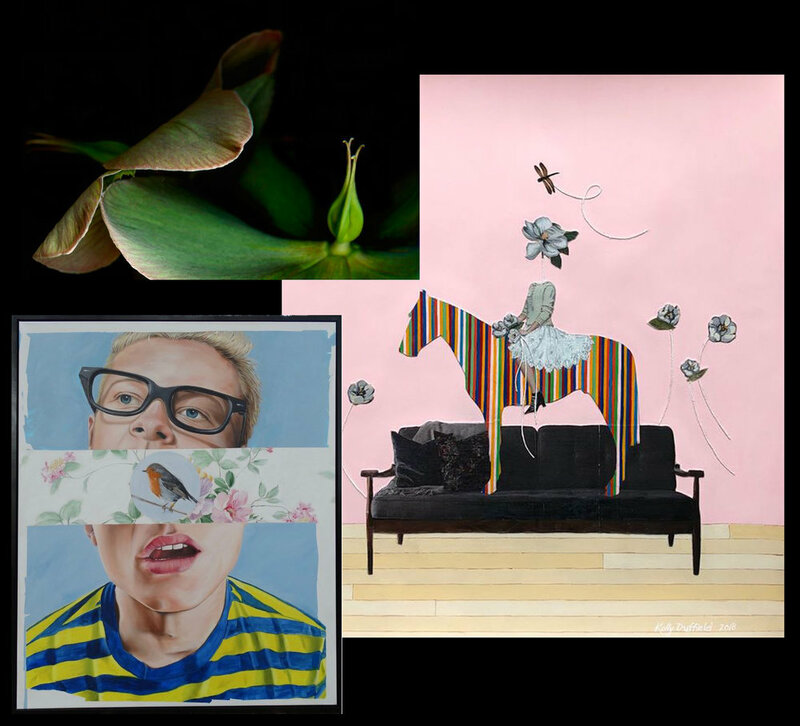 March 7 - 24, 2019: Rochelle Dammel & Alissa Davies - "Cultivation"
Rochelle Dammel’s latest show at Core, Cultivation, shows her determination to stay in the moment while art making, and offers art lovers a pure look into her subconscious. Dripping, swiping, and scraping acrylic and oil paint on wood and canvas gives her the freedom to explore textures, shapes and mark making that often tell stories. As a writer and process painter, Rochelle Dammel is interested in telling the stories of her subconscious. Cultivation is a compilation of her efforts to illustrate her underlying thoughts. Painting spontaneously allows colors, shapes, textures and mark making to channel through her into her art. 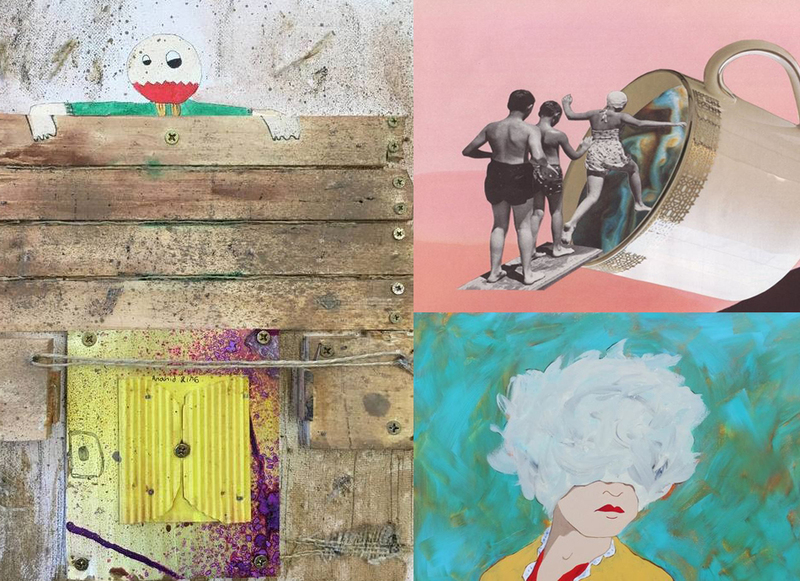 By applying multiple layers to each piece, she cultivates visual stories. Intuition and trust of skill are her guide as she adds layers and complexity to her art, inviting viewers to see their own version of the stories she paints. Having recently moved to Colorado, Alissa Davies’ current show examines the complexity of repositioning oneself in new environments, new communities, and new situations. The longing for the familiar home paired with the growth that comes from moving somewhere new, Cultivation conveys the myriad of feelings that occur with relocation. Davies is interested in the ways that the art-making process reveals effective methods and tools for navigating the life-making process. The messages include and are not limited to: staying open to the unknown, staying with the ugly stages of a painting (and of life), being curious and exploratory, relishing in beauty and harmony, risking, and knowing when to stop. Davies’ paintings emerge from an intuitive place, intermingling with knowledge of color theory, composition, and painting techniques. Each piece is generated spontaneously, taking cues from her inner world. As a painting progresses she is interested in the interplay of form and the harmony of colors, while staying true to the organic forming of shapes and textures. Play, experimentation, movement and curiosity guide her process. 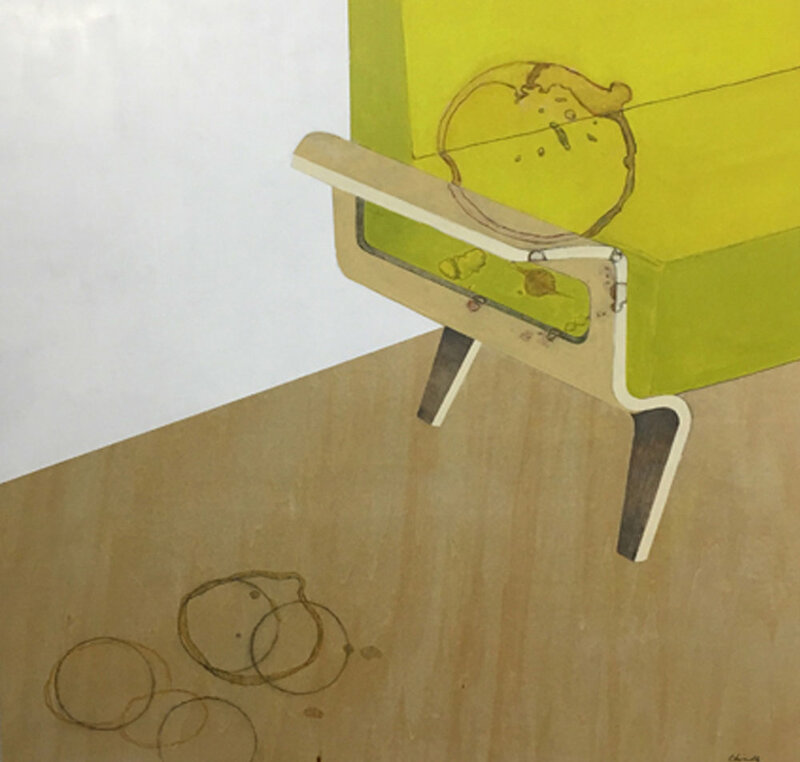 Jean Smith’s current work is based on the feel of the Mid-Century Modern decorating shapes and placement from the mid 60’s, and 70’s. Each wall composition can be an entity of its own or joined with others to create a larger design element. She uses clay, stains and glazes to create the 3-D components of the pieces. Annette Coleman’s current interest deals with art in the public realm. This installation represents an idea that could be translated for a public space or your home. Rita Bhasin's paintings express the tactile, bold and colorful quality of her love for the outdoors, ancient cultures and natural materials. She brings to life the quotidian, letting us pause and experience the textures of each moment. I am interested in making art that is borne of one single uninterrupted line which never crosses overs itself and has a clear beginning but a very inconspicuous ending. 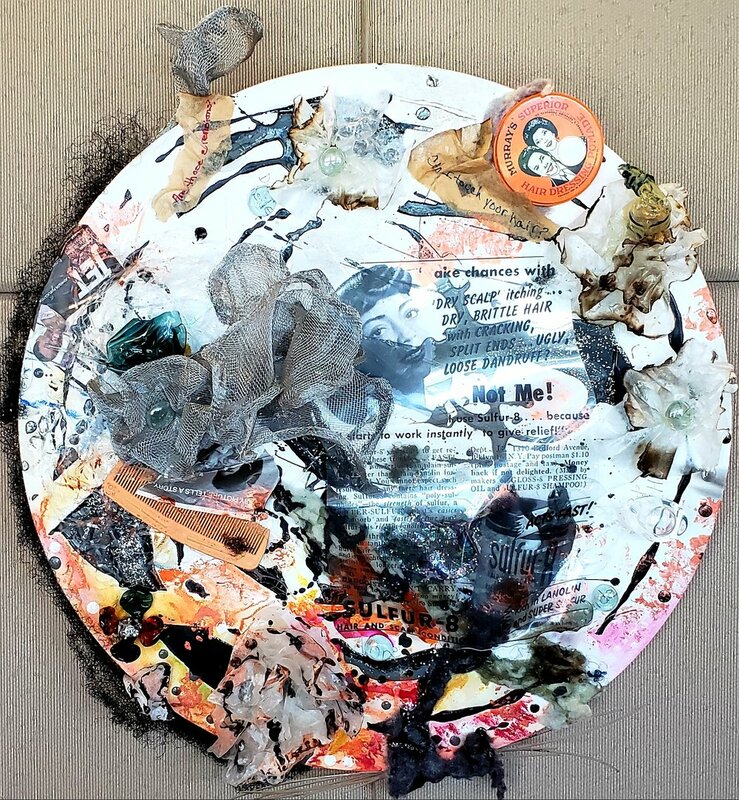 This interactive art installation and exhibit by artist Carrie MaKenna explores The Universal Circle through painting, sculpture and play. It’s a culmination of 30 years of interest, study, practice and teaching about the Circle as a unique Universal Pattern and Spiritual Resource. The Circle is found at the center of many spiritual traditions including the Native American Indian Medicine Wheel, the Celtic Stone Circles, the Buddhist Tangkas and Hindu Mandalas among countless others. 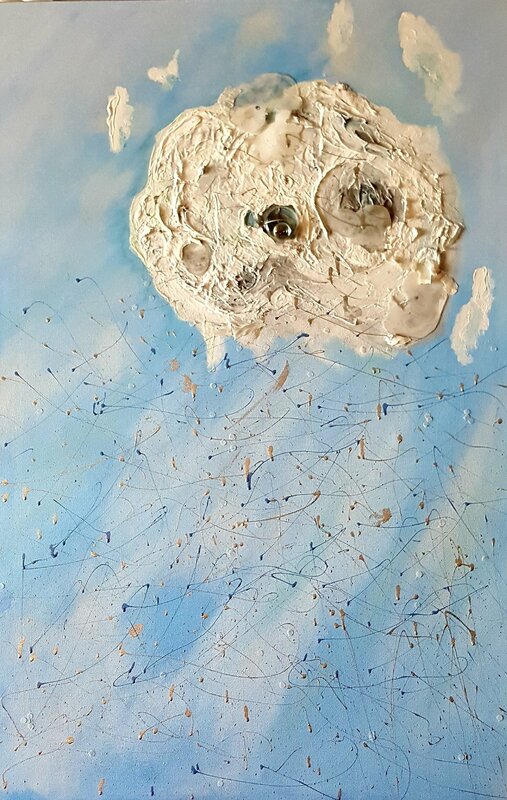 The Artist has also had a deep life-long interest in Space, the Solar System and the intricate cycles of the Sun, Earth and Moon that define our life on planet Earth. Sandy Marvin is a contemporary realist painter who enjoys painting with pastel plus dashes of other media in the mix. She paints primarily from life; plein air or still life. 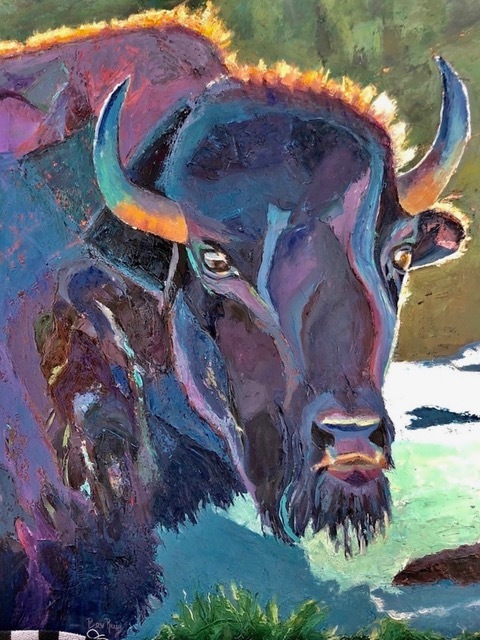 Bev Ruiz is a Colorado based artist who began painting with oil as a creative outlet. Growing up in the Southwest and throughout her travels, her inspiration comes from observing what is not always noticed. 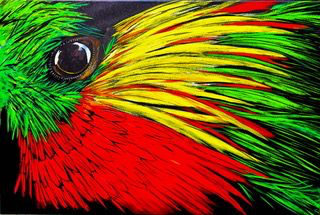 Her art reflects the bold and vivid colors she sees in nature and everyday life. Primarily a studio painter, she shares her artistic expression thru imaginative layers of bold colors, textures, and brush strokes. “I have to continually evolve each painting thru many layers to create the right sensation”. The Small Works Show is honoring the concept of artwork in any media 12 inches or less in all dimensions. Juried by Victoria Eubanks, who serves on the board of directors at the Arts Student League of Denver as well as a faculty member. Her work has been exhibited nationally and hangs in corporate collections. Artwork selected represents various styles and mediums from national as well as international artists. Come one, come all and experience a unique carousel of rusty elephants and horses, fortune tellers and toads. This multi-faceted dreamscape of attractions is the culmination of artworks by Claudia Roulier & Michelle Lamb. Can art makes us better human beings? 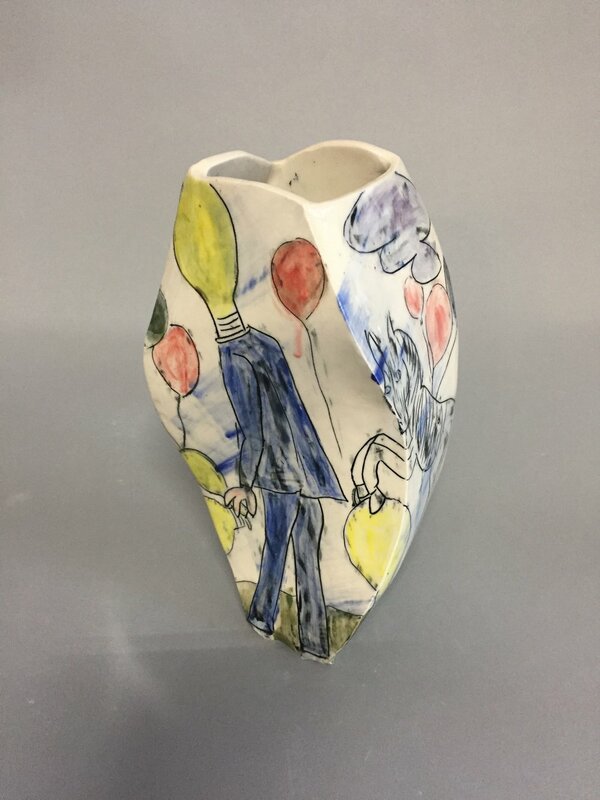 I’ve created a grouping of pieces that offer the opportunity to explore the idea of Artopism--the innate ability to emotionally react to art in a positive way, resulting in personal growth and a greater understanding of those around us. Like a sunflower turning towards the sun, or a seedling reaching for the sky, the goal is growth. I use layers of drips, bright colors and thickly spread oil paint on canvas to create comparisons and discussion. My preference is to paint large, to create a more thorough experience. How can we grow as people through our innate reaction to, and interaction with art? Is it possible to achieve personal growth through self-reflection and discussion of what we find compelling, or even odd in art? A long time member of CORE New Art Space Gallery, Gina Smith Caswell works only in oil paints and enjoys exploring pattern, color and texture within her well known body of floral images. 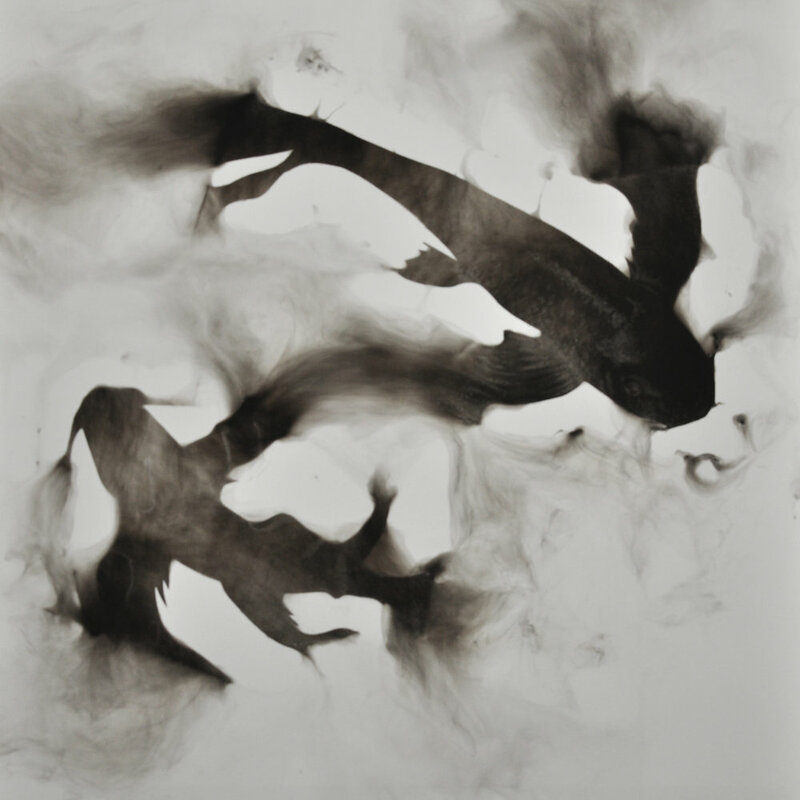 She also utilizes similar expressive techniques when exploring abstraction, water imagery, and portraiture. My recent abstract expressionist work is based upon my perceived awareness of the natural environment. In my studio I’m trying to recapture the subtle mystery or “numinosity” of nature on a 2 dimensional piece of birch panel. I use many layers of oil paint, wax, graphite, oil stick, and pigment. By scratching a texture or expressive line into the medium with different tools, the layers are revealed! It is as though there is a contrasting conversation I have in the studio, a back and forth between order and disorder. My practice is experimental. It involves a series of decisions that contain a history of creation and elimination. Working with variety of techniques and approaches, I create strategies that I fallow and break. By challenging the way, the painting is constructed each layer caries or destroys prior ideas by cutting and fragmentation of previous gestures. The practice is a kind of choreography; a dance between spontaneous and learned behaviors. Both my conscious and unconscious are played out at different times. It is about knowing when to embrace expectations, rules, desire, and even fear, but knowing that it is equally as important to tell when to let them go. Through my art work I try to bring the outside in by portraying plants and animals. I see my creations looking as if they have lived or grown somewhere, beautiful objects that pay tribute to the natural world. My goal is to inspire those who see my work, to look more carefully at the world around them to discover beauty in unusual places. Flora and fauna is the world of living things. “Flora” designates plant life, and is also the Roman goddess of plants and flowers. In Roman mythology, Flora symbolized nature, flowers and fertility. Fauna was the Roman goddess of animals, wildlife, fertility and spring. Hence the word “Fauna” designates all animal life. What does Flora and Fauna mean in today’s world? How do you relate to nature in today’s technological environment? Regan Rosburg is an artist and naturalist. Regan teaches Fine Arts and Foundations at the Rocky Mountain College of Art and Design and Metro State University in Denver, Co. She is known for her carefully constructed, layered resin paintings, as well as her sensory-laden, emotionally evocative installations. A published writer and passionate speaker, Rosburg’s commitment to environmental causes is evident in her poignant artistic imagery, talks, and writing. Her first curated show was Axis Mundi,a massive exhibition on the topic of eco-psychology (2017 Denver Biennial of the Americas). She is represented by William Havu Gallery. Jude Barton’s work explores the form and function of line, shape and space; creating a certain uncluttered calm and freedom within her structuring of fragmented and blurred iconic images. Her uninhibited wanderings towards creative vision and away from annihilation strive to bring reason and structure within chaos and clutter. Primarily exhibiting on Canyon Road in Santa Fe, NM, Brian Haley explores the synergies and contrasts between clean rolled steel and distressed wood, Haley works to assimilate the disparities between century old hand salvaged mine wood and mid-century modern design characteristics to create one of a kind tables, chairs, and wall art. With Coloradans often ranked the most active in the nation, it’s no wonder so many of its residents are enjoying the Rocky Mountains in every way possible. We hike to amazing places to ski. We bike scenic byways and mountain trails. Simply put, we love our outdoors. Artist Leslie Jorgensen travels across the Rocky Mountains and the West skiing, hiking and biking along the way. She paints the landscapes she visits and our outdoor activities within it. Her landscapes are abstracted and playful. Join us as we close out the summer season with this fun show that runs through Sunday, Sept 9. Donny Dixon uses fire to create his art. This primal element gives the work a push-pull relationship of chaos versus control. This technique, combined with other mediums, creates rich and complex surfaces that contain both concrete and ethereal elements. It is here on these surfaces that he can build a stage to provoke response, and combat the overwhelming noise that fills our lives. 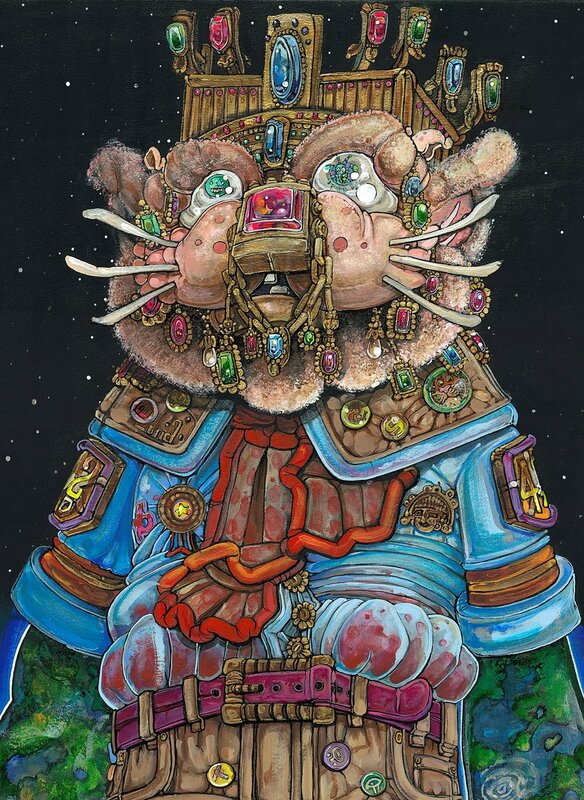 Born from the political maelstrom that has defined the last several years, Chuvarsky’s paintings seek to critique the continued divisiveness and disinformation of modern politics while examining the issues that define American culture, whether it be our insatiable appetite for consumerism or pop-culture rhetoric. By acknowledging and documenting the flaws, Chuvarsky hopes to shift focus to something uniquely American: optimism. Emerging Artist Melissa Van Deventer, a Colorado Native and Graduate of the University of Colorado Fine Arts and Art History Department, is sharing her beautifully unique abstract pieces with us in her Go with the Flow Show starting August 2nd. Her love for paint in its purest form influenced her recent works involving various pouring and color mixing techniques, that create beautifully organic contemporary compositions and unveil a unique beauty in the eye of each beholder. Similar to a modern-day Rorschach Test – you’ll leave the Go with the Flow Show with a delightfully unique interpretation of the paint combinations you’ve seen. This exhibition seeks to show art that has cast away the color system and focuses on the visual power of black and white; reflecting the innovative and contemporary in painting, photography, drawing, printmaking, mixed media and sculpture. This show was juried by Dr. Deanne Pytlinski, Art Dept. Chair at Metropolitan State University of Denver and and features both regional and national artists. Rolf Helland’s oil and graphite drawings on canvas reflect his fascination with the destructive forces on the urban landscape based on images that he finds through the media. His new body of work draws the viewer in for a closer look and reveals raw and complex snapshots in time. Jim Riggin’s ideas most often come from the thoughts he has when sleeping or walking and moving about the city. Often focusing on the imagination and which medium is needed for it’s effect, he sees subjects in black and white, in color or in wood and steel. Often working on 2 or 3 different projects at a time which take on various forms usually unintended, Jim finds satisfaction when completing each and signing his name. Linda Gleitz presents “Social Structure” a multi-piece work consisting of 80 “buildings” about social justice on many different levels. Linda calls it a “city” made of clay. The buildings average about 9 inches-ish. The buildings are full of people doing all of the nefarious and pleasant things that people do behind closed doors. Linda will also show individual pieces that are part of her “army” of goddesses. Their purpose is simply to bring compassion and beauty to our world. Andrea Gordon’s collection of work called “What’s Next” is about embracing change and taking chances. The varied works reflect Andrea’s exploration of abstract painting from the past 3 years. Trying to be free and open throughout, she created groups completely different from one another using different techniques or sources of inspiration. Moving onto larger works, Andrea pushes the boundaries of color and pattern, most notably a 6’x8’ mural made of 24 separate pieces – each standing on it’s own while being part of the whole. Most recently, large scale paper-mache sculptures and ceramics incorporate her unique style. 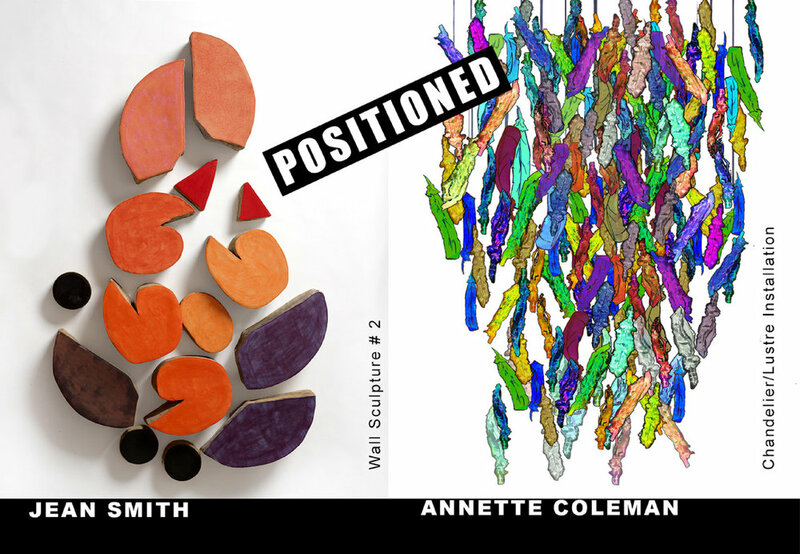 "Within" is an exhibition of art created by University of Denver students in an experimental workshop taught by Professor Deborah Howard. In the course personal expression was strongly encouraged and students were free to work in any media. Students had their own studios in a large classroom that was a community where the exchange of ideas flourished. "Within" explores childhood, memory, cultural identity and the natural environment. Media and subjects include: portraits in ois, photo transfers on fabric, sculptures made of toys and animated digital media. A painting, a drawing, a sculpture... NO! It’s mixed media! It’s all of those things and more. Showcasing endeavors in assemblage, mixed media paintings, collage, sculpture and all that you can imagine. Suzette Rosenthal is a mixed media artist living and working in Broomfield, Colorado. She received her BA in Art from Cal State LA and is a recent transplant from Laguna Beach California. While living in California, she exhibited for ten years at the prestigious Laguna Beach Sawdust festival and taught classes and workshops in mixed media. She has contributed instructional chapters to two publications available on Amazon: “101 Mixed Media Techniques” (2014) and “Mixed Media Workshop” (2012) Suzette continues to teach mixed media classes and workshops from her home studio in Broomfield and serves on the board of the Broomfield Art Guild. Her work is unique and visually compelling. 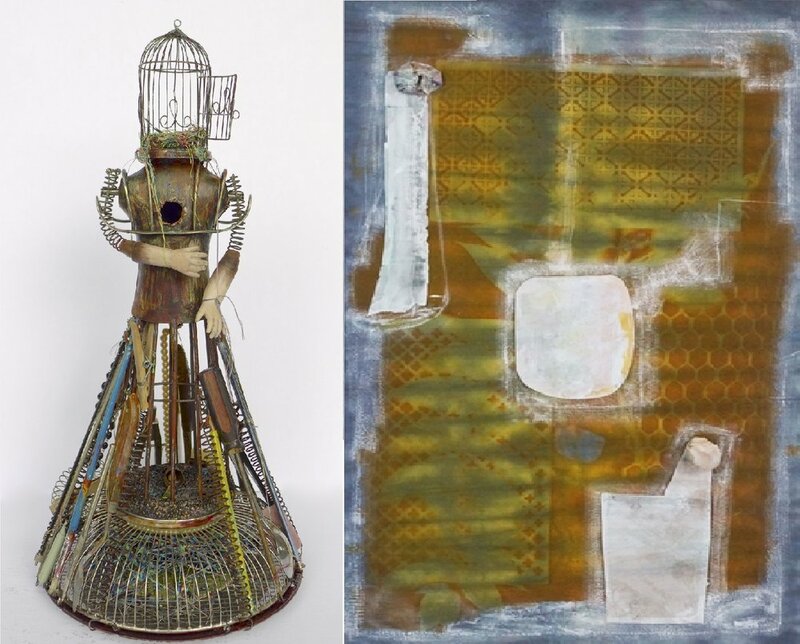 She is drawn to textures and likes to experiment with incorporating found objects and upcycled materials to create visual interest. Taking the cast-off objects of others and bringing new life and meaning to it is a driving force behind her inspiration. 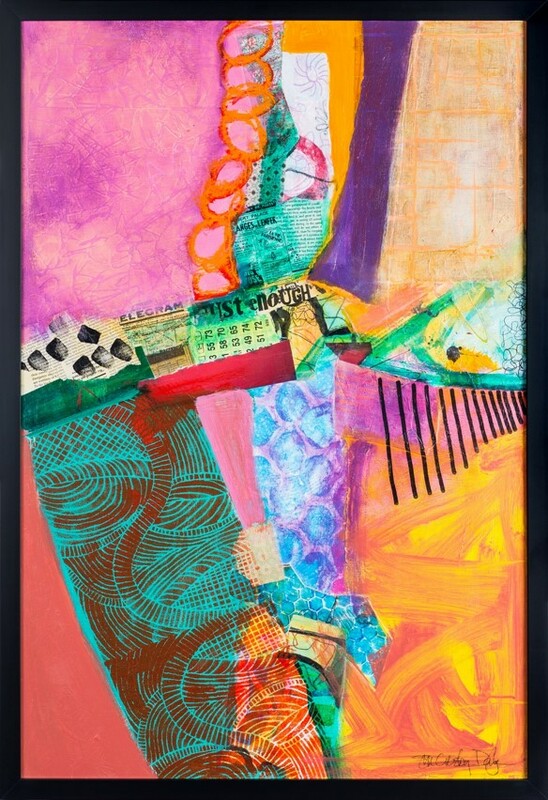 “Dazzle & Jazz” features artists Victoria Kwasinski and Joyce Nielsen who take an intuitive approach to abstract painting, using color and structure in variegated and expressive ways. Victoria explores energy, rhythm and movement as unspoken dialogue with the viewer and Joyce examines the aspects that different mediums in contemporary art and how that process can both hint at fun and whimsy while conveying seriousness. Repetitive patterns have been the focus of my sculptures and pottery. But recently, intrigued with imagery and storytelling, I find myself moving in the direction of drawing on vessels; their forms like a blank canvas with shape. Influenced by ever-changing events in the world; floods, fires, mudslides and colorful politics, while not favorite subjects, are sometimes reflected in my drawings which are a delicate balance of fantasy and reality. “Feeling blue” is a collection of blue artworks created by Ketty Devieux over the past 10 years on canvas, paper and textile. The versatility of hues of blue to express, by means of different techniques, a wide variety of emotions (longing, nostalgia, loss, exuberance, serenity, trust etc.) as well as spiritual aspirations of the soul, and dreamlike fantasies, is made evident. It’s a journey through memory and consciousness. 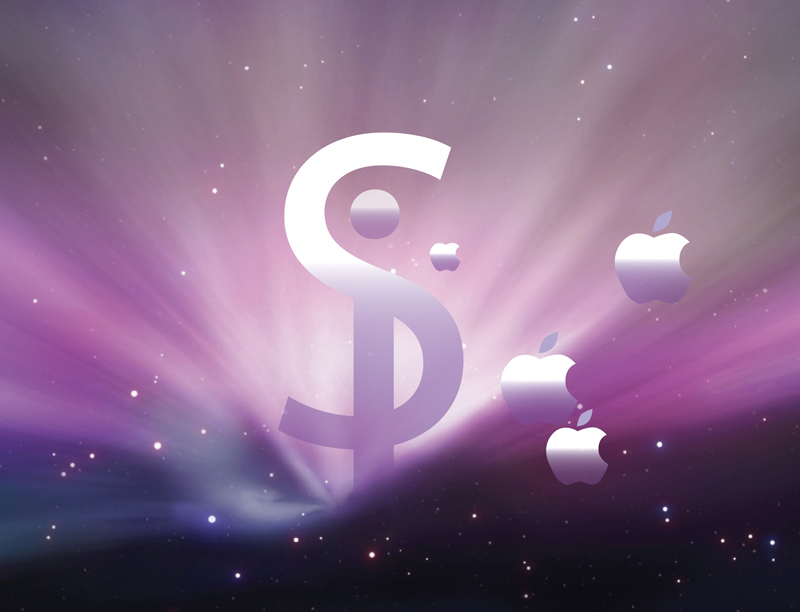 Celebrate your devotion to your electronic devices through a visit to the Silicon Shrine. A glittering installation where you can experience the power and voice of the great god Si, pray for intercession to repair your failing operating system and purchase actual relics from the first cosmic explosion which created our binary universe. Photography reimagined, digitally scratched and gesturally designed, unbounded pieces and sculptures evoking nature. Complemented by precise geometric paintings projecting playfully colorful daydreams of strength and erupting violence. 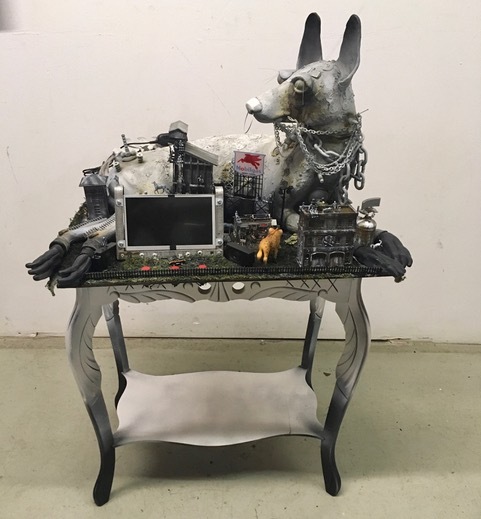 Viewers will encounter an adult-themed take on cartoonish characters mixed with geometric robots and rabbits along with delightful provocations of traditional norms. This colorful collaboration between these two friends poses the question who is predator and who is prey. 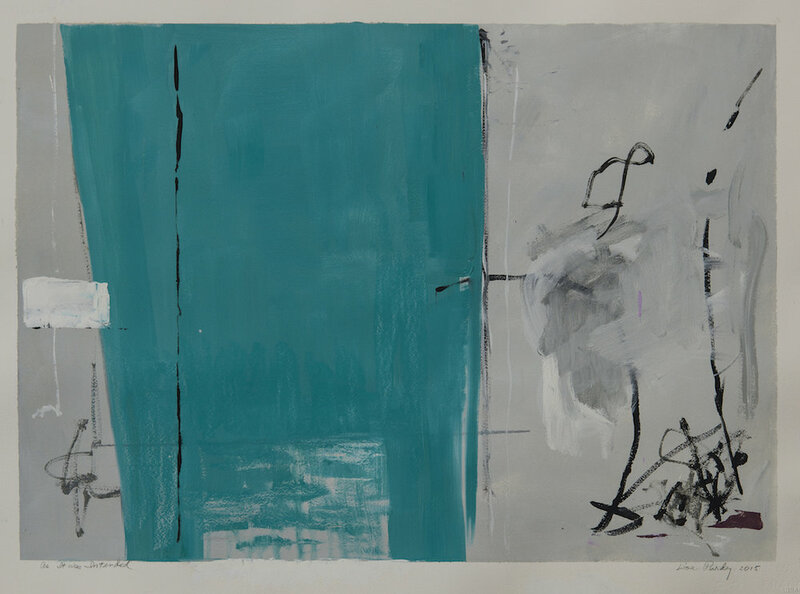 Emmanuelle Auzias explores turquoise, a color that intuitively finds its way into her abstracts and associated in several cultures as therapeutic in its protective properties and helpful in reconciling grief with positive mothering and controlled nurturing. Green relates to the heart chakra and blue to the voice which aptly fits this powerfully emotive work that is a genuine conversation about personal emotions and observations. Additionally, Emmanuelle shares her latest mixed-media collages inspired by traditional French free-speech satirical comments on current events. Jen Herling’s doll like figures and portraits tell enigmatic and emotive stories. Her work evokes magical dreamscapes depicting a flair for innocence with a dark twist. “Savage Calm” consists of new work highlighting a slight shift towards realism, including a deepening understanding of space, light, and color. 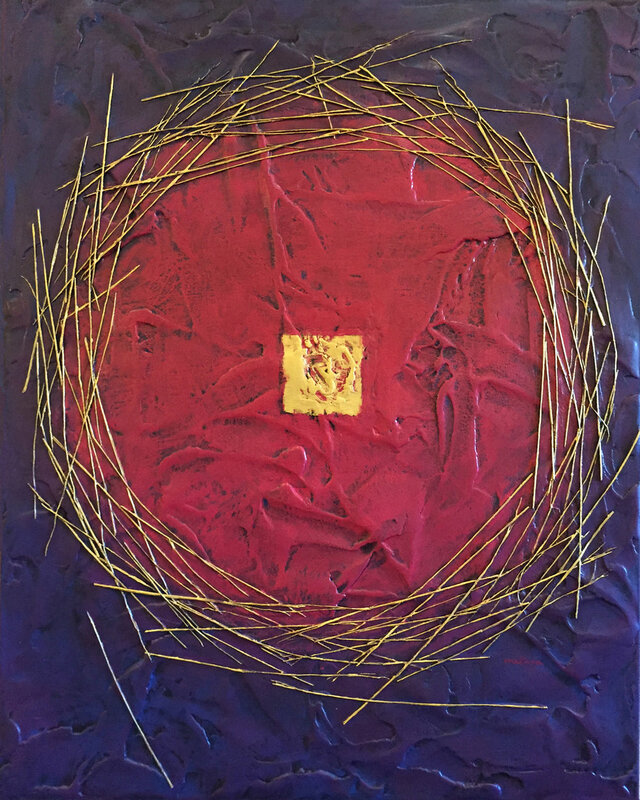 Woven throughout her exhibit are themes of surrender, perseverance, and spirituality. Ms. Purdy’s pieces for this exhibit are made from water-based oils on watercolor paper. She interweaves bold uses of color and lines to create an almost three dimensional quality. These smaller scale works represent a new style for Lisa in comparison to her large-scale abstract oils for which she is well known. Award winning Ms. Purdy has been juried into numerous exhibits around the state, including the State Capitol, Denver International Airport, and the Botanic Gardens. The WOW show has been a Denver metro-area tradition for over 25 years. Artists of all skill levels and media are represented. Come to the gallery and experience the cacophony! This new body of work by Jeanette Chinelli titled "Arms Backs Legs & Seats", moves from quiet, understated restrained imagery to explosive, dynamic compositions. From dense interplay of pattern, vivid color and wallpaper motifs they become the backdrop for the subjects in Chinelli’s art where the chair is the stand in for the human form. Chinelli is currently attending the University of Denver working on a Bachelor of Fine Arts degree. Terrilynn Moore’s organic, soul searching compositions, “Working from the Guff”. She draws from the ancient spiritual meaning of the word “Guf” or “Guph” as that creative, amorphous space inside each of us where art begins; that place where souls are quickened into being. “For me, the Guf is that internal space full of wonder and fear; hope and despair; goodness and evil. The National organization was founded in 1972. The Colorado Chapter was founded in 1990, and is celebrating their 28th Anniversary. There are currently over 25 members in the Colorado group. Our mission is to create community through art, education, and social activism by supporting women artists, by creating leadership opportunities, and by offering exhibition opportunities.